Following discussions with shareholders and interested parties, the Strategy of Sirma Group was updated during in 2017. On February 01st 2018 Sirma Group Holding officially disclosed their Strategy for Development and Growth for the period 2018 – 2022. The Strategy presentation provides information about the activity, structure, history and achieved results of Sirma over the years. These results are the foundation for the successful implementation of the updated Strategy of the Group. The aim of the technological transformation of Sirma is the concentration of its cognitive technologies and R&D in the Sirma ENterprise Platform with AI (SENPAI in short). This will allow the Group to develop strongly competitive applications in the chosen verticals of specialization. The Strategic aim of the Group is reaching EUR 120 million of sales revenue by 2022. This corresponds with CAGR 35% of revenue over the period. The Strategy provides 70% of sales revenue in 2022 to be generated in North America and Europe with a overwhelming share (again 70%), achieved using the XaaS sales model. The fast growth rate should be achieved while preserving the operational efficiency of 29% EBITDA margin. 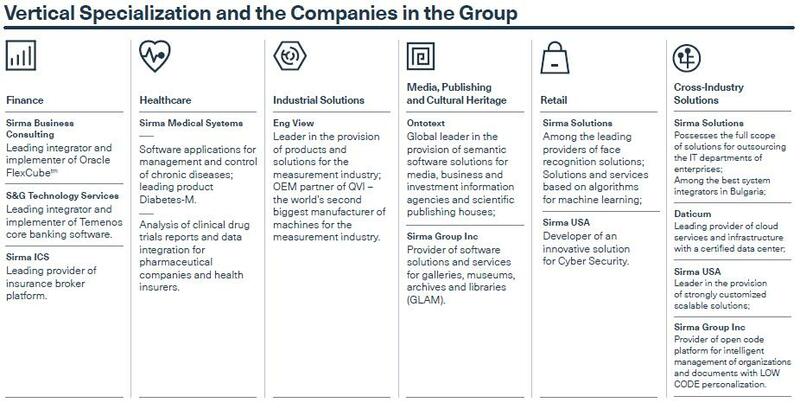 Parallel with the consolidated Group targets, Sirma provides the anticipated development, aims and strategic steps of all six vertical segments of specialization. The presentation of the Strategy may be accessed and downloaded from https://2022strategy.sirma.com/en/.